Mussorgsky was part of a group of composers referred to as The Five. The other four members were César Cui, Aleksandr Borodin, Mily Balakirev, and Nikolay Rimsky-Korsakov. Their goal was to create a national school of Russian music that existed entirely without western influences. It was to be its own style of music with its own set of rules. Towards the end of Mussorgsky's life, he became an alcoholic. Finding himself alone on too many occasions, he turned to alcohol to comfort his emotions. Unfortunately, this led to several alcoholic epilepsies and multiple trips to the hospital. Mussorgsky was born to a wealthy, land-owning family (though their wealth was barely a few generations old; his great-grandparents were serfs). Mussorgsky's mother was a skilled pianist and began teaching him when he was young. By the time he was 7 years old, he became quite proficient and was performing works by Franz Liszt, albeit moderately easy ones. In 1849, his father enrolled him and his brother into St. Peter's School, where he studied piano with Anton Herke, along with his general studies. In 1852, he entered the Imperial Guards Cadet School where his published his first piece, Porte Enseigne Polka. In 1856, he joined the Preobrazhensky Regiment most, Russia's most elite regiment. Mussorgsky met many officers who shared similar musical passions. He met Aleksandr Borodin, a future member of The Five. Borodin, along with the other cadets, liked having Mussorgsky around as he would often play the piano at parties; the ladies would woo and sigh over him. The course of Mussorgsky's musical career changed when he was introduced to Aleksandr Dargomyzhsky, one of Russia's leading composers. Mussorgsky began developing his own Russian musical style. In 1858, he quit the army to devote his life to music. With his father's death in 1853, the freeing of the serfs, and a career in music, Mussorgsky family wealth had essentially dried up. Mussorgsky often turned to borrowing money to make ends meet, and lived in a small "six-man commune." In 1863, he took a low-level civil servant position within the Ministry of Communications. By this time, Mussorgsky was largely teaching himself music. He worked on several operas, Salammbo, and The Marriage, but failed completing them after losing interest. He later used passages from Salammbo within his more famous opera, Boris Godunov. In 1867, he completed Night on Bald Mountain. 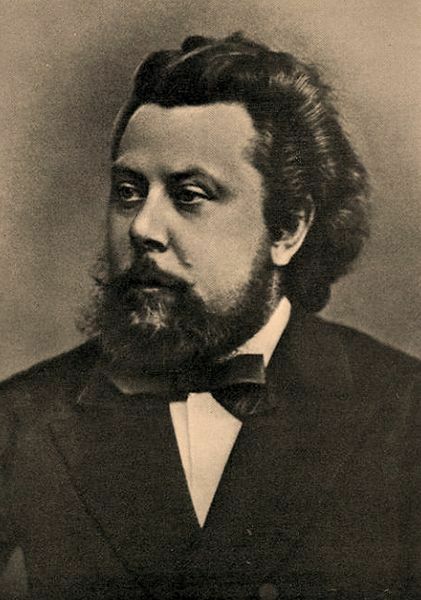 Mussorgsky had developed a taste for alcohol, likely picked up from cadet school. Several years prior, in 1865, his mother died. He lived briefly with his brother, before moving into a small flat with another composer. Though he was a member of The Five, his lifestyle remained quite different. Many of his works remained unfinished. His opera, Boris Godunov was started in 1868, but it took nearly four years of off-and-on again commitment to the piece before it was finally finished and performed in 1974. It was a large success for Mussorgsky. However, it was downhill for Mussorgsky from there. When The Five began meeting less and less, Mussorgsky started feeling bitter. He would often have fits of madness, largely due to alcoholism. He had begun to fall away from his friends, a close friend of his had died, and another had moved away to get married. Mussorgsky fell deeper into depression and isolation. However, he still managed to compose several pieces of music. He even toured to multiple cities as an accompanist for an aging singer. Sadly, in 1871, he experienced three consecutive alcoholic epilepsies and was taken to the hospital. While there, he had his portrait painted. He died a month later.